Traditionally, small niggles and aches that are left to linger and not treated in their earliest onset can result in expensive claims, lost time and a decrease in productivity. While these injuries have significant financial impact on an organisation, they also negatively affect the injured employee. Bodycare’s Onsite Occupational Physiotherapy service is key to managing the musculoskeletal health of your workforce. As the largest provider of onsite physiotherapy services throughout Australia and New Zealand, we offer tailored solutions to effectively reduce the cost and prevalence of injuries in your workplace. 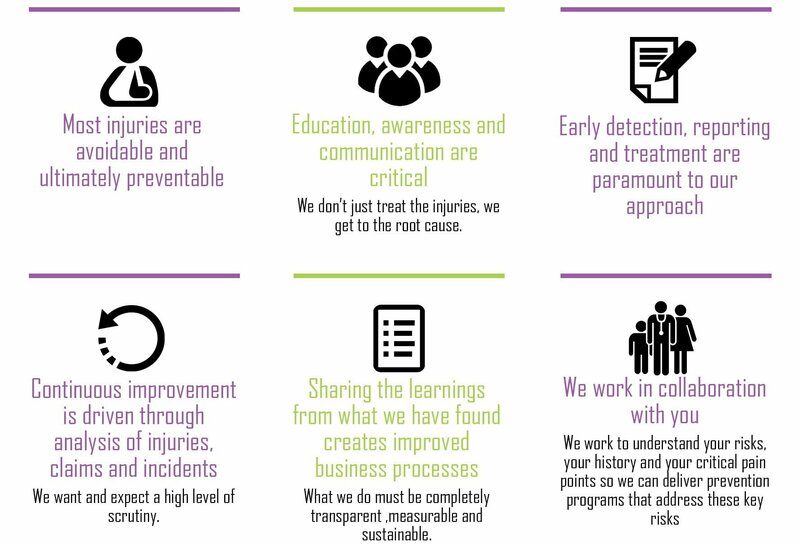 Bodycare’s model demonstrates that taking a proactive approach and encouraging early reporting and early intervention injury management ensures that low grade sprains and strains, are dealt with well before they develop into a costly burden to employers. At its core, our onsite specialists focus primarily on injury prevention to mitigate risks in the workplace through a unique combination of proactive initiates and hands on treatment to ensure your works remain fit and healthy. The very best organisations ensure that there are robust screening procedures and targeted role training in place. When a player feels even a hint of pain and discomfort they have it attended to quickly by a highly trained physiotherapist. The treatment, the task modification and the education happen instantly. This approach reduces the chance of a minor niggle becoming a serious injury and is communicated effectively to all key stakeholders in the organisation. The quality of our people and onsite physio specialists underpins our capability to serve our clients. For this reason, we invest tremendous resources in identifying exceptional practitioners, developing their skills, and creating an environment that fosters their growth as health professionals. Our team of highly qualified occupational physiotherapists have the experience, knowledge and ability to deliver a first class service to our clients. Do you have a burning question about onsite physiotherapy? Click on the links below to find the answers to these questions and more. Alternatively, click here to contact the Bodycare team to find out more about the services we provide. 1. What is the role of an onsite physiotherapist? 2. What is the difference between physiotherapy treatment and injury prevention?